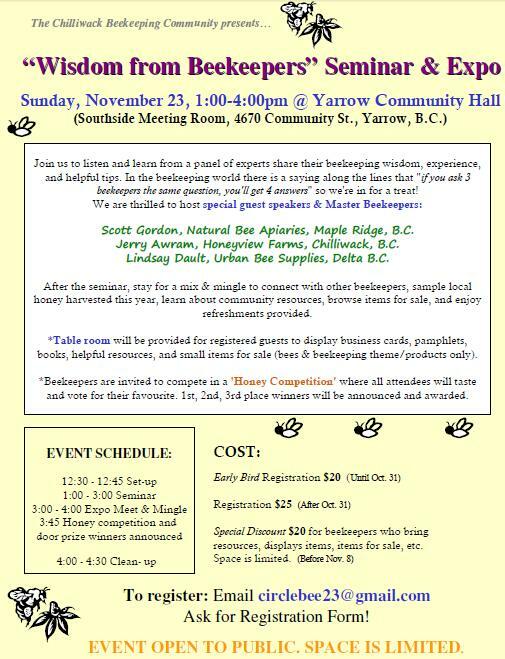 he Chilliwack Beekeeping Community presents, "Wisdom from Beekeepers" Learning Seminar & Community Resource Expo November 23 from 1-4 PM at Yarrow Community Hall. Listen & learn from a panel of experts who will share their beekeeping wisdom, experience, and helpful tips. In the beekeeping world, there's a saying along the lines of "if you ask 3 beekeepers the same question, you'll get 4 answers", so those attending the event are in for a treat! Special guest speakers are all Master Beekeepers and include; Scott Gordon from Natural Bee Apiaries; Jerry Awram from Honeyview Farms and Lindsay Dault with Urban Bee Supplies. After the seminar portion of the event, guests are invited to stay for a Mix & Mingle to connect with other beekeepers, sample local honey from this year's harvest, learn about community resources, browse items for sale and enjoy the refreshments provided. Registration and a small cost is involved ($20 Early Birds, $25 Regular) and space is limited! • It's a great way to network your business if you make & sell beekeeping equipment, sell harvested products, or simply have a passion for bee-themed crafts or artwork. For those interested in learning more about this event & for registration forms email the group here. The Yarrow Community Hall is located at 4670 Community St., Yarrow BC. The Chilliwack Beekeeping Community is for beekeepers and bee enthusiasts who live in Chilliwack, Agassiz-Harrison and Hope (and neighbouring cities). The group came together in June 2013 for the purpose of connecting with other beekeepers closer to home & for the sharing of resources, wisdom and experiences. The group meets once a in a variety of settings including bee yard field trips, socials, picnics, workshops, etc.